It’s not quite the Talladega Nights vision of Jesus in a tuxedo t-shirt singing lead for Lynyrd Skynyrd, but Risen casts the Biblical story of the resurrection as a political thriller. Director/co-writer Kevin Reynolds (Waterworld) clearly has his eye on more than just the “faith-based” demographic. There’s good business in that audience, to be sure, but Risen is geared toward attracting more mainstream moviegoing tastes as well. 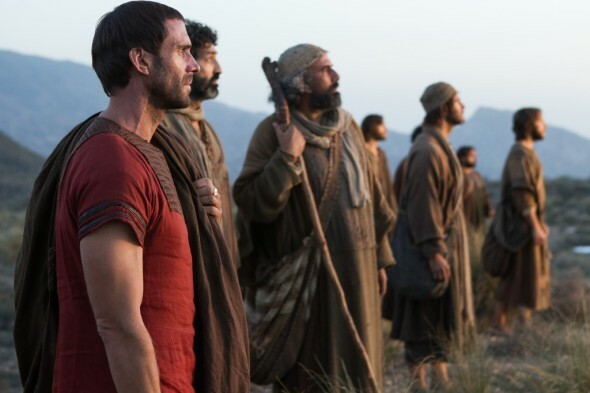 The film establishes a “non-believer” point of view at the outset, shortly after Pilate (Peter Firth) informs his trusted tribune Clavius (Joseph Fiennes in fine form) of the order to crucify “Yeshua” (Cliff Curtis). With a visit from the Emperor looming, Pilate charges Clavius with ensuring that the growing threat of Yeshua’s disciples dies with him. Of course, the plot thickens once Yeshua’s body vanishes from the tomb. Clavius and his apprentice Lucius (Tom Felton) begin a desperate search for the body, or any body that might convince the masses their Messiah is dead. It always seems awkward for Biblical characters to be speaking English, but here it fits the “B” movie feel of the narrative, as early political intrigue gives way to an all out manhunt. Regardless of what’s being spoken, Yeshua as portrayed by veteran supporting actor Curtis, a New Zealander with a Middle Eastern look, is a nice piece of casting. A more familiar faith-based structure emerges in the film’s third act, as the doubting Clavius begins to see things he cannot explain, and the film’s worldview shifts to that of the converted. That’s not an inherently bad thing, and the film gives the journey a welcome nuance. Though Reynolds overdoes the symbolism at times (Pilate washing his hands, Mary Magdalene bathed in sunbeans), Risen leans more on intelligence than obedience, and is ultimately more believable for it.